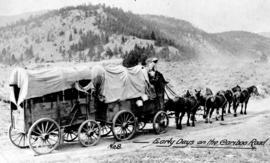 An early automobile being passed by a freight team on the Cariboo Road. An eight-horse freight team on the Cariboo Road. Boston Bar; wagons on their way from Hell's Gate to Lytton on the Cariboo Wagon Road; note the pigs foraging in the street. Breaking camp at "Lost Meadow" on the V.W.N. and Yukon Railway survey. Freight wagon on the Cariboo Road. Going out - survey pack train near Poplar Lake. Horse Team Hauling Heavy Machinery For Kafue Copper Company Bucket Dredge. Marvin Baker, Quesnel, Teamster. Loading a pack horse at Quesnel for a survey packtrain. 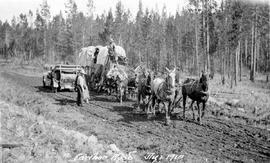 Loading the pack train; Atlin-Quesnel telegraph line. Pack train cossing Last Creek; Atlin-Quesnel telegraph. Pack train crossing Deserters River during the exploratory survey for the V.W.N . & Yukon Railway. Pack train in the Street of Barkerville, cooling off having just arrived from Below. Pack train leaving 150 Mile House for the Skeena River.